The Advent of TUF: Winter. Break! 1) xmas is already over? whoa! 2) the YEAR is nearly over? WHOA! 3) what all just HAPPENED?? And that final question, my dear reader, i hope to answer here--mainly for myself, though i deeply appreciate all y'all out there who pursue a mild interest in the various TUF antics. now for starters, let's push all the holiday warmth and romance aside and talk chicken issues. i spend a fair amount of time discussing the cute and fluffy aspects of urban chicken keeping, and haven't had to explore too many ugly or less desireable topics so far. until the foul Fowl Pox! that's right, people get chicken pox, chickens get fowl pox. it's a virus spread by mosquitoes that is also communicable between chickens, so it gets the whole flock. it causes little gross dots on your birdz. (here's more info from the backyard chicken peeps, if you are interested.) they can only get it once, thankfully (just like people chicken pox! ......what?) and it isn't too bad and goes away after awhile. but it was GROSS, and it caused the ladies to be less lay-ful. which was really just as well, because the good people at callahan's recommended we do a round of tetracycline antibiotics to prevent secondary infections. and, of course, when they're on the antibiotics, you don't eat the eggs! fowl pox is totally the worst! anyway, we are recovering, and egg production is coming back slowly but surely. all the ladies look better than ever, and seem to frantically enjoy the sunshine we've had for the past couple of days. i'm sure there will be a fancy chicken photo shoot in the near future. on to more pleasant things: my 31st birthday came and went delightfully, thanks to my amazing family and friends. the most TUF-related treasure i received was this MARVELOUS ceramic egg tray! it fits perfectly in the egg compartment in the fridge. i love how the eggs look in it! this year the TUF hosted our first xmas banquet, gathering family from near and....well, mostly near. san antonio and austin o'neils and camerons were present, and our brother-in-law-to-be braved the long and squishy drive from houston. the normal TUF living room was transformed into the Banquet Hall, and we were a merry bunch, all 8 of us! i made ugly-but-tasty cabbage, roasted carrots, mashed potatoes and cloverleaf rolls; our auntie brought a green salad, grilled asparagus and bread puddin'. gwen brought key lime pie, killer cheezcake and the cameron traditional Christmas Salad. 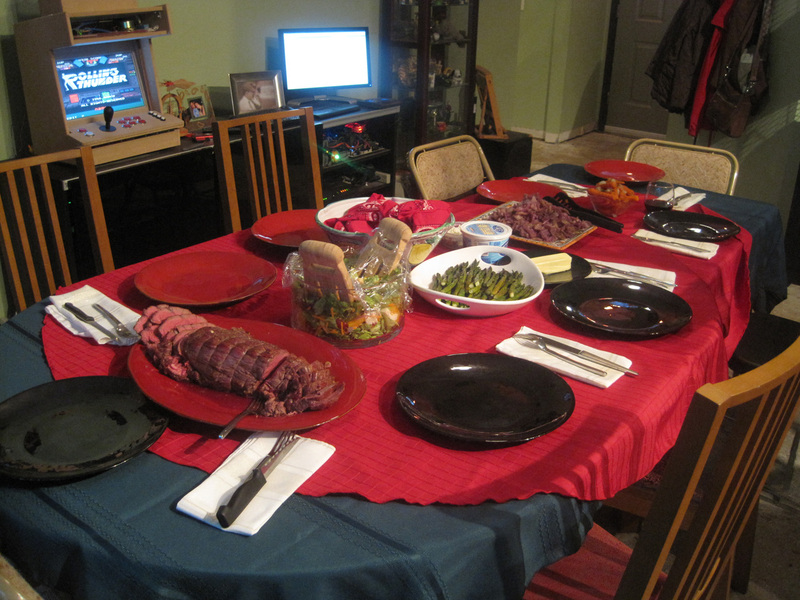 and dad--oh holy night!--brought the Beef Tenderloin. the wine flowed like.....um, wine! the bread was broken! seconds were had! deliciouscity ensued! and gifts and hugs and kisses were exchanged, as befitting a proper xmas. but then, after all the anticipation and cooking and present-hiding and aromas and unwrapping, it's over! december 26 comes, and everything goes back to normal. ....except not QUITE, ever, here on the TUF. we happened to have a pheasant thawed on this weeknight-after-xmas, and some organic butternut squash. that's right, a pheasant! ha! why not! we treated it just like we treat most birds headed for the rotisserie, as discussed before...rubbed and trussed, and rotisseried for about an hour. this time we stuffed it with half a squeezed-out lemon, a carrot and some garlic cloves. i threw the giblets in a pot with some water, more carrot, the other half of the squeezed lemon, some spices/garlic and a frozen leftover roast chicken...um...carcass (sorry) to make a quick broth for gravy. i know, totally ridiculously un-necessary, but it's a pheasant, it should have gravy. i don't know why. it smelled DELICIOUS. while the bird roasted and the broth bubbled away, it was time to deal with the two tiny butternut squash. dan cut the tops off, hollowed out the bulbs, and diced the flesh to stuff back in the center later. the shells went in the oven first, at 350 degrees, for about 15 minutes. we sauteed the chopped up fruit from the necks and bulbs for a moment, to soften and garlic them up before replacing them in their native gourds to finish cooking. then dan decided that these squash had faces. without further ado, the squash guys were carved and stuffed with more of themselves and some shredded cheddar, much to their apparent displeasure. they finished baking while the pheasant, rice and broth turned, boiled and bubbled away toward dinner. everything cooked for just about an hour. though FAR too much food for even us totally urban farmer types (ha! ), it turned out to be an amusing and deliciously fancy dinner. note to self: no matter how tiny you think it is, ONE BUTTERNUT SQUASH is all you need for two people! just one! see how grumpy they get! anyway, new culinary and farming adventures await in 2012....new egg layers! massive compost production! the fabled garden? who knows! i can't wait to find out. and i also hearby resolve to try not to let so many weeks go in between posts again. it results in long and blithery posts like this one! as always, Gentle Reader, thank you for your time and attention. stay tuned!